The STEP team is excited to participate in another Construction Month with the BC Construction Association and BC construction industry! Let’s celebrate the many contributions that BC’s construction industry makes across our province, in every community, every day. With 30 days of celebration, we’re fitting a lot in this April. From Flagship events with a Launch Breakfast, Procurement Summit and BCCA Leadership Dinner to Contractors Breakfasts in communities across BC, we hope you’ll join and celebrate with us. Below you’ll find a ways to get involved this year. 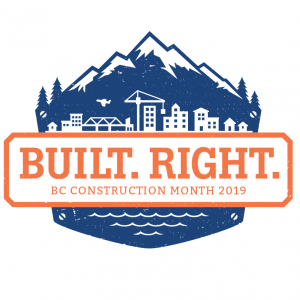 To learn more about Construction Month 2019 (including additional details for events and sponsorship opportunities), visit constructionmonth.ca! Take a look at Construction Month 2018! At the urging of the BC Construction Association, April 2018 was officially proclaimed Construction & Skilled Trades Month in BC by the Minister of Advanced Education, Skills and Training. For the first time ever, industry came together to celebrate the many British Columbians working in the skilled trades, and the employers who support them.